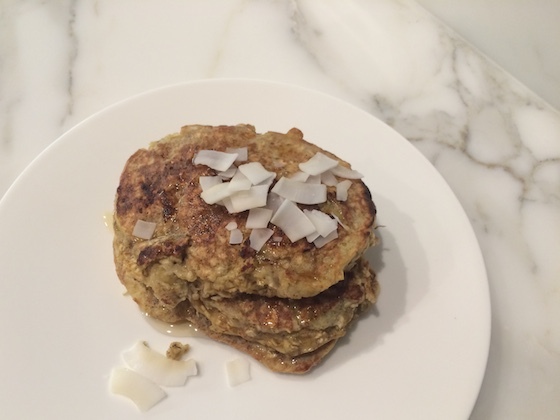 These pancakes are the perfect healthy treat for a weekday morning. They’re so easy to make and contain only wholesome ingredients – eggs, banana, and rolled oats. Plus, they’re high in protein and low in sugar. This means that you will be full for hours! Last but not least, they taste delicious; almost like whole grain banana bread. I topped mine with a bit of coconut oil, a drizzle of honey, and some coconut chips for a super yummy, tropical-tasting treat. Mash the banana in a bowl. Add eggs and stir until thoroughly incorporated. Fold in remaining ingredients. Heat a pan or griddle over medium heat. Grease with cooking spray or butter. Pour batter onto pan to form 3 pancakes. Cook, flipping once, until lightly browned and cooked through, about 5 minutes per side.